Think Out of the Box QUILT CLASS! Who says “SUMMER SCHOOL” is no fun? We certainly don’t!! Getting out a couple nights a month with a friend to make something beautiful and enjoy a cold beverage and some snacks while you are at it – now that’s the kind of summer school I like! Check out our “Events” tab on this website for the new 2017 class schedule. You’ll see more great classes like this one coming up in June . . . .
For “Confident Beginners to Intermediate” quilters. 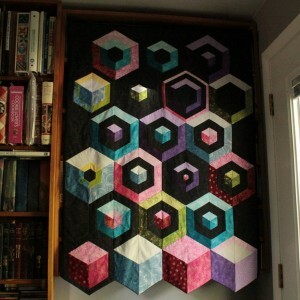 Make this 3D quilt in just 4 Wednesday night classes in June & July! Learn how to cut and piece 60 degree triangles to create a 3D illusion of stacked or floating cubes. This quilt is a step up from the traditional baby block quilt. Class nights are on June 14th & 28th, July 12th & 26th. Sign up with a friend and enjoy a night out! Out with the “OLD” – but let’s be nice! Cathedral Windows one stitch at a time!